There are few events as exciting as game day in Chicago regardless of what your chosen spot happens to be. 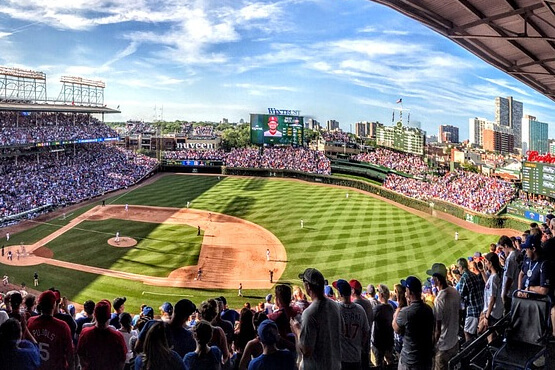 Our sports teams in Chicago have developed a truly loyal following, and that's pretty obvious from any game that you attend. With all of the teams, there are opportunities to enjoy the sports community in Chicago all year long. When you're a dedicated sports fan, you know how fun tailgating can be. Some fans look forward to the tailgating portion of the game experience more than the action itself! It's the perfect time to pre game, socialize, enjoy great food and better company. In the current age where nearly everybody is always busy, it's great to be able to set time to party and relax with your friends at a tailgating celebration. A Chicago sports party bus is the perfect addition to any tailgating party that you might be planning! Reserving transportation for your game day experience in Chicago is the perfect way to elevate the level of fun and ensure convenience for the entire group all at the same time. If you've ever driven around the traffic that surrounds a stadium before or after a game, you know it's not fun to navigate in any capacity. You have to figure out directions, try to get through the traffic, and figure out a good parking spot that isn't three miles away! When you reserve a Chicago sports party bus, not only are you getting an updated party bus or limousine, you're also getting the expertise of a chauffeur. They know the most efficient way to get in and out of the stadium areas so you're not wasting time, and they can drop you off right at the doors! If you plan on drinking during your tailgating experience, it's the safest and most responsible thing to consider professional transportation. Instead of trying to pin down a hesitant designated driver in your friend group, take the time to reserve a limousine or party bus. It's a lot less expensive than a run in with the law! Not to mention, the amenities in luxury vehicles will always go above and beyond what you have in your sedan or SUV. Some of the amenities inside of a Chicago sports party bus include large flat screen television monitors and DVD players, top notch stereo systems with the ability to stream your favorite playlists, counter top areas and cup holders for your beverages, comfortable leather seating for a group of passengers, and fun neon lighting. You can choose to continue the party on to other destinations, or stay put in one spot. Either way, you will have a ton of fun without ever having to deal with the hassle of driving yourself around the downtown area of Chicago. After you use a professional transportation service once, you will want to apply it to all situations where you are driving a group around in a busy area. We are here to answer any questions you have about the sports experience!